A question we hear quite often is, “How does a fixed index annuity make money?” That’s a great question because there are a lot of options available when it comes to how your Fixed Index Annuity will earn money. These options are called crediting methods. In this article, we will focus our attention on the Point to Point crediting method for fixed index annuities. In upcoming posts, we will discuss the monthly sum and the monthly average crediting methods. When you have a Fixed Index Annuity, you will choose an index, or multiple indexes, to track with your money – depending on what is available in your contract. Ten or fifteen years ago, we were limited to just the S&P and the NASDAQ – and those are still great choices – but there are many more indexes available now… Bond indexes, Real Estate, Commodities, the JP Morgan MOZAIC, S&P Volatility Control…there are a lot of options out there. When you first look at an annuity plan, you might find the crediting choices to be a little overwhelming, but if you know a few basic terms, you can understand any crediting strategy. With point to point crediting, the insurance company takes a snapshot of the market on day one of the contract, then they take a snapshot of the market at the end of the crediting period – typically it’s one year, but there are contracts with two year, and even three-year point to point strategies. If the index has lost value between the two points, you will not lose any money, because your principal, and any previous gains, are protected against loss. If the index has gained value there are a few different ways you might benefit depending on your contract terms. Let’s look at some examples assuming the index is up 20% over the crediting period. Now we need to know our participation rate, and whether our contract has a cap – or a spread. To keep things simple, let’s say we are working with a point to point cap of 8% and our participation rate is 100%. That means there is a ceiling of 8% on our gains, and we are tracking the index based on 100% of our money. It is normal for caps to fluctuate up and down throughout the life of an annuity contract. In general they tend to trend up and down with treasury rates. Depending on your contract, you may also see your participation rate change. Before you buy an annuity, I recommend you find out the contractual minimum caps and participation rates. Some fixed index annuities offer uncapped crediting strategies – meaning there is no limit to how much you can earn. Sometimes though, there is a percentage, called a spread, that is deducted before your gains are credited. In this example, we have the same 20% index gain with 150% participation rate and a 5% spread. In this case, we are participating in one and a half times the index gain – or 30% – minus the 5% spread – so we would be credited with 25%. If the index was up 4%, we would participate in 6% growth, and after the 5% spread, we would be credited with 1% gain. 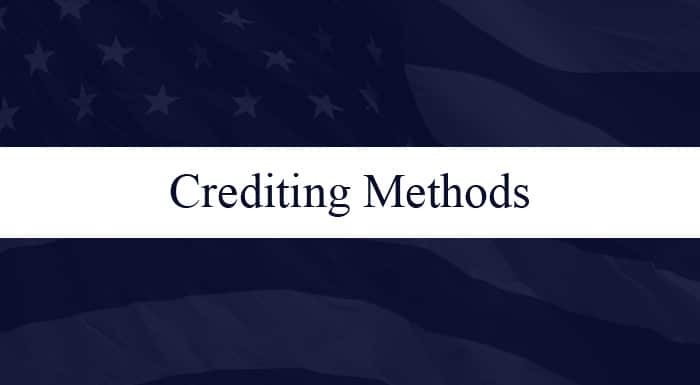 Now that you understand point to point crediting, be sure to read our upcoming articles detailing two other popular crediting methods, monthly sum crediting and monthly average crediting scheduled to be released later this month. To learn about the annuity crediting methods now, simply sign up for our free 8-part video series on fixed index annuities called “Securing Your Retirement Future”. In our video series, we cover the four types of annuities, principal protection, multiple crediting methods, growth guarantees, annuity payout rates, and much more. Simply click on the banner below, fill out the form, and receive instant access to our series to view at your convenience.